The authors present pictorial survey of the world of Advertising Paperweights. Collectors of both advertising memorabilia and paperweights will be have fun browsing this reference. 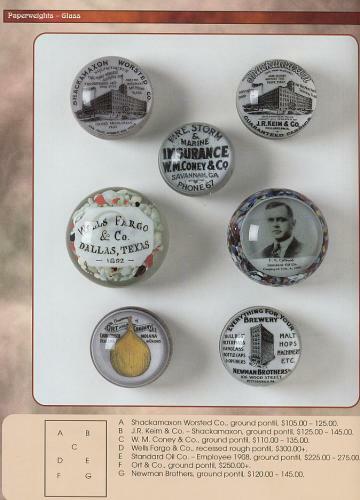 Advertising paperweights were made in various sizes and dimensions for display purposes and product promotion. They became popular in the late 1800s, when businesses began to experience significant expansion and city populations were showing marked growth. The book is a pictorial history of American advertising – many old products and businesses have left their marks under these glass paperweights, often the only glimpse left of bygone eras. This book features not only glass, but pot metal or iron, brass, bronze, and pewter paperweights of all shapes and sizes. All the major companies are represented, including Abrams Paper Weight Co., Barnes & Abrams Co., Samuel Ward Co., Mid-West Ad. Co., The Donker & Williams Co., Metropolitan Glass Co., and more. Included with each photograph is the name of the paperweight (advertiser), collector value, and comments on appearance. 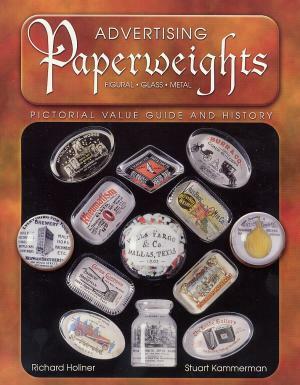 197 pages with color photographs of over 1,000 paperweights. Soft bound. 8 1/2" by 10 3/4". 2002.